Say goodbye to Liam and Dixon. This is a photo from the 90210 series finale. Will Naomi be able to help Jordan's sister avoid trouble on 90210? "Scandal Royale" is the 22nd episode of the show's fifth season. Naomi and Annie may both end up with relationship issues on the next 90210. "You Can't Win 'Em All" is the 21st episode of the show's fifth season. It doesn't look as though Naomi is doing much to impress Jordan on her trip to New York on 90210. "The Empire State Strikes Back" is the 20th episode of the show's fifth season. 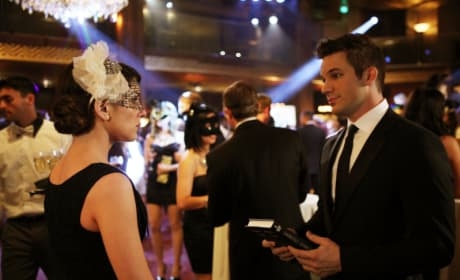 Naomi dons a mask in this photo form 90210. But the secret is out: we can totally tell it's her! 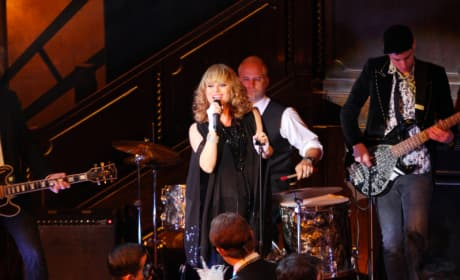 Dhana Taprogge performs here on 90210. She's a musical guest on the first episode in April 2013. Annie is Author X. She is forced to own up to this fact on the episode "A Portrait of the Artist as a Young Call Girl." 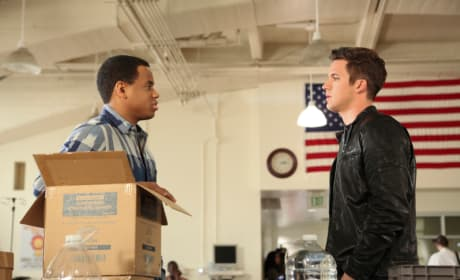 Pictured in this scene from 90210: Grant Gustin as Campbell and Matt Lanter as Liam. Navid and Silver cozy up in this photo from 90210. It's courtesy of the episode "A Portrait of the Artist as a Young Call Girl." Annie's secret identity as Author X finally comes out on 90210. "A Portrait of an Artist as a Young Call Girl" is the 18th episode of the show's fifth season. Naomi gets hugs from The Real Housewives Brandi Glanville and Camille Grammar on 90210. "Dude, Where's My Car" is the 17th episode of the show's fifth season. Is Naomi telling Annie about Mark's big offer on 90210? "Life's a Beach" is the 16th episode of the show's fifth season.